There used to be a time when I would get giddy about going to an airport. That feeling right before I was getting on a plane was like entering Disney World as a kid. I loved it but somehow the airlines have taken all the fun and excitement out of airline travel. These days all I can think about are all the things airlines do that drive me crazy. We are all miserable about the extra luggage fees for checking bags when flying, and to save $25 – $45 bucks we are all jumping on the “carry-on only” bandwagon. This has created a new kind of chaos when traveling as there is not enough overhead room for all the roller bags we are bringing on the plane. So the airlines have produced stricter rules, and I hate to break it to all of you, but these are not working either. Recently, I arrived at the airport and proceeded to the counter where an angry looking check-in man looked over at my roller bag and gave me a little come over here motion with his finger. I travel with Heys Luggage. This is a luggage company that has devoted its life and mission to making sure that their carry-on bags fit into the metal wireframe airline checking system thingy. It’s a hard case bag that does not expand – I know, and everyone at Heys Luggage knows this bag is going to fit. When the angry check-in man picked up my standard bag and put it into the metal wireframe, this was only confirmed. So here’s the thing. Both bags are going on the same plane. Both have a weight limit of 10 kg. One bag is 11.1 kg, and one bag is 5 kg. So I’m under the 20 kg limit. Are you telling me that 1.1 kg more in the overhead bin is going to break the plane? Furthermore, hypothetically speaking, what if I move the 1.1 kg from one bag to the other, go through check-in, security and then when sitting at the gate in front of the plane, I move the 1.1 kg back into the roller bag? What’s going to happen? My ticket which was purchased for me on this flight included one checked bag, so I figured I wouldn’t going to let this angry check-in man ruin my day and I checked my bag. You’d think this was the end, but no, it got better. At the departure gate, the angry check-in man shows up with his wireframe thing. He then began calling all the people who checked in online through the loud speaker. He started checking all their bags to make sure requirements were met. There was a lot of yelling and angry passengers fighting with him as he made them pay a penalty to check their bags. Sky check or checked bags – it’s the same thing! So now I get to the part that just baffles me. When were finally called to board the plane over the speaker, I heard, “Please note due to the size of the plane, all roller bags will not fit in the overhead compartments and will have to be sky checked.” What? If the plane was too tiny and you knew that roller bags don’t fit in it then why didn’t you just include checked baggage in these tickets? Why did we all go through all this crap with our bags when they were going to be checked anyway? Unfortunately this happens routinely. Sometimes the planes are smaller, so therefore shouldn’t the carry-on policy reflect the kind of plane I’m traveling on? Why do they make the check-in process so difficult when they are going to check the bags anyway? There is nothing more annoying than after landing at the airport, trying to get through the crowd of passengers waiting for their sky checked bags at the plane door. People are trying to get out. Sky checking bags has to be the single stupidest thing airlines have ever invented. Baby strollers and wheelchairs, OK that makes sense but luggage? No thanks. The other thing that airlines do that drives me bananas is overbooking flights. I understand they want to fly planes full. But have the people in the head office that make these decisions ever had to sit at a gate and watch people crying or screaming because they are the unfortunate ones who were bumped from a plane due to overbooking? This scene at the airport is horrible to watch. Most of us sit at the gate praying our names are not called. We sit with our heads down listening to someone crying about a special event they are going to miss and our hearts ache because we don’t want to give up our seats to miss out on getting to where we need to be. I watch the angry businessman guy who is banging his suitcase against the counter because he’s going to miss an important business meeting and am just scared he’s going to snap and kill us all. I can’t be the only one that has experienced this scene. It’s happening just about every time I fly. Maybe not always at my gate but somewhere over the speakers I always here “This flight is full, and we are taking volunteers to switch flights.” Which almost always is followed by airport departure gate chaos. So I implore airlines, can you come up with standard airline bag checking policy which allows all the passengers on the plane to bring their items on board without chaos? I mean are you profiting from applying a stupid fee to checked baggage? Do you not see the utter stupidity in the whole sky checking of baggage? 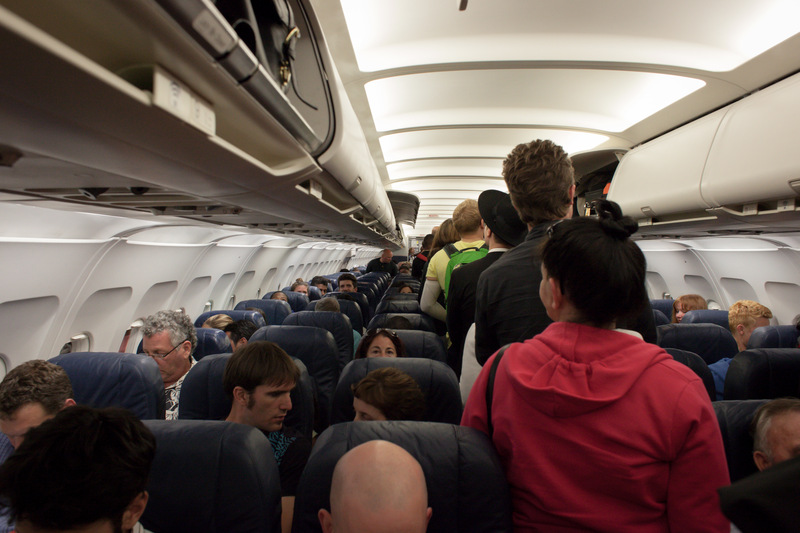 Can you figure out a way to fill your planes without inconveniencing innocent people? Let’s make air travel fun again!